The collection has Australia-wide and Indo-Pacific representation, plus some world specimens for comparative purposes. The collection comprises 1200000 pinned specimens, 450000 specimens in spirit and 20000 slides. There are 8670 holotypes, of which 5000 are from the A.M. Lea beetle collection. There are 23000 other types. Primary types are held in the general body of the collection. In summary, the entomological collections Class Insecta comprise 662 Australian families and 85,961 known Australian species. The arachnological collections comprise spiders (50000 specimens in alcohol), mites (25000 slide mounts and 20000 specimens in alcohol), scorpions (5000 specimens in alcohol) and myriapods. 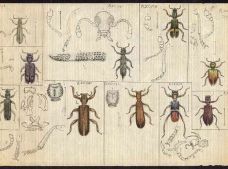 All orders of insects and arachnids (s.l.). The estimated number of specimens in the South Australian Museum Terrestrial Invertebrate Collection is 1,770,000. The South Australian Museum Terrestrial Invertebrate Collection has an estimated 1,770,000 specimens.